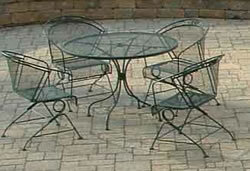 Concrete pavers are becoming the "norm" for paver patios and driveways. The reason is that concrete pavers are now manufactured to look like any type, shape or color of paver and are extremely durable and cost effective. The excitement of a concrete paver patio has never been greater than today. Offering an inexpensive surface with so many attributes, such as flexibility, no more cracked, dim colored concrete, less water runoff (which helps capture needed water through the surface), vibrant colors and various textures and dimensions all add-up to a win-win situation for the person desiring something different at affordable prices. For years within the construction industry, homeowners either had to spend thousands of dollars for natural stone surfaces, or, if stone pavers was cost prohibitive, clay brick pavers were an alternative. However, clay brick paver surfaces needed to be laid on a concrete slab and set in mortar just as natural stone pavers and this just adds up to thousands of dollars more than using concrete patio pavers. So again, concrete pavers, with all their various colors and shapes, offer affordable pricing with a lifetime guarantee against cracking. The Concrete Driveway Paver is offered in several different thicknesses in order to achieve more strength than most concrete or asphalt slabs could ever achieve. It’s also a good thing to realize that your Concrete Driveway Paver accepts a certain amount of rainfall which recharges our Earths system instead of running down the curbside and into the sewer. If you want to add a splash to your property at an affordable price, be able to enjoy it for the rest of your life, it’s not a question of comparing concrete or asphalt to Pavers, simply because concrete or asphalt have very little aesthetic value and are subject to cracking apart. If you come visit ALL Masonry and Landscape Supply, we have over 10,000 square feet of installed concrete pavers in our outside showroom. We also can help you with instructions on installing concrete pavers and showing you the vast assortment in colors, sizes and shapes of interlocking concrete pavers. If you need help on how to install concrete pavers for your home, our company has the largest inventory of concrete paver manufactures in Southern California. At ALL Masonry and Landscape Supply we are proud to show Ackerstone pavers with their look-a-like granite cobbles or brick concrete pavers in shell stone finishes. 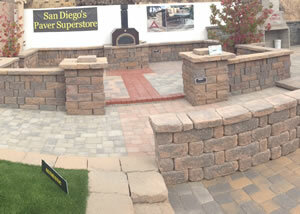 And Belgard with their various Old World styles and attractive matching wall systems. We have all these installed at our Vista store in North San Diego County. If you want to see Angelus Pavers in their popular Courtyard Blend colors, we also have those installed to help you design your project. Installing concrete pavers can be fun, exciting and can reward you by giving you an exciting concrete paver patio, walkway or a magnificent entrance to your home using concrete paver stones. 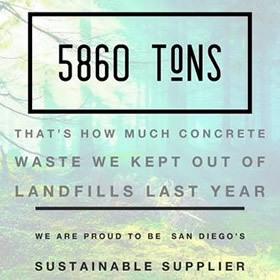 We also offer tool rentals, we recycle your old asphalt or cracked concrete at our company and sell and deliver you the recycled material for your new base to hold your concrete pavers. If you need help in design or installation of interlocking concrete pavers, we have free literature and color samples to help you. Come visit our 10,000 square feet Outside Showroom today!